If you want to enjoy a family holiday surrounded by stunning views of mountains and much more then Scotland is one place you really should head to. We went there for a cottage holiday in August, and it was amazing. We chose to head to Loch Ness; renting a holiday cottage in Fort Augustus from cottages.com. Our thinking was that it would be a great hub for a family holiday and to be a suitable place for me to go on some photography outings, and we weren’t wrong. We rented a stunning 5-bedroom house less than 100 yards from the stunning Caledonian Canal that leads into the loch. We had to pay a premium because of the school holidays, but it was well worth it. Fort Augustus is a quaint little village that sits right on the south end of Loch Ness. 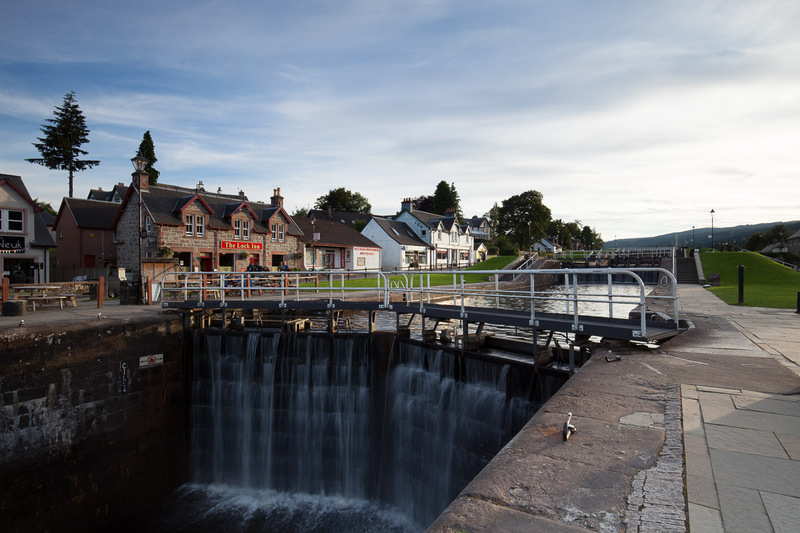 The heart of the village encompasses the Caledonian Canal, with a stunning set of locks that lead down to the very end of Loch Ness. The River Oich runs almost parallel with the canal and feeds into the Loch, meaning that without going anywhere there is a range of stunning views to be had of the canal, the loch and surrounding mountains. Watching the boats traverse the canal locks is a brilliant thing to witness, although crowds of people line the banks to watch this making taking pictures, or watching from a distance a real chore. To make the most of the amazing scenery that Scotland has to offer, it is important that you have a car, or similar transport. Having the freedom to explore will allow you to see some of the famous surrounding lochs, mountains, castles and much, much more. We hired a people carrier to make sure we had enough room for everyone, but it made a great vehicle to use for going out on my photo shoots; especially at 4-5am. With our visit to Loch Ness and Fort Augustus, it would be a travesty to not go out onto the loch, and a good way to do so was on one of the tour boats. these boats are popular, but we managed to secure a seat for everyone on the last trip of the day, which was timed perfectly with the sunset. Sitting on the top deck of the boat meant that we had stunning views in every direction, although taking pictures was a challenge at times among the other tourists. This is to be expected though, and I still got some amazing photos. While we failed to spot Nessie, the boat ride was amazing, and my youngest son absolutely loved it. Heading back towards Fort Augustus as the sun dropped behind the mountains was a memorable experience; especially with the lack of midges that stay close to the shore. We went to see Eilean Donan Castle for one of our excursions. The castle is imposing on the banks as you approach it, and it is easy to see why it features in so many photos. Sitting where the sea lochs meet (Loch Duich, Loch Long and Loch Alsh), the castle looks absolutely amazing. Looking around the castle was great fun. It was disappointing that cameras are not allowed in many parts of the inside of the castle though. For such a well-regarded tourist attraction, I thought this was quite surprising. Trying to get photos in the courtyard allowed for very little creatively. I guess this was because of the peak time, meaning that the castle was quite busy. It was OK for family snap shots though, and the selfie brigade 🙂 . Fly fishing is synonymous with Scotland. My father in law is a keen fisherman, and whenever we are on holiday we always like to find a spot to go fishing. He loves to pass on his skills to his grandchildren. We found a quiet fishing lake near Fort William and had a great afternoon lazing on the water’s edge trying to catch fish. I would have liked to try fishing in the rivers, but that isn’t as child friendly. We had some great tales of the ones that got away, but the fish eluded staying on the flies for long enough to land them. We like to catch and release anyway, so the fight is most of the fun! 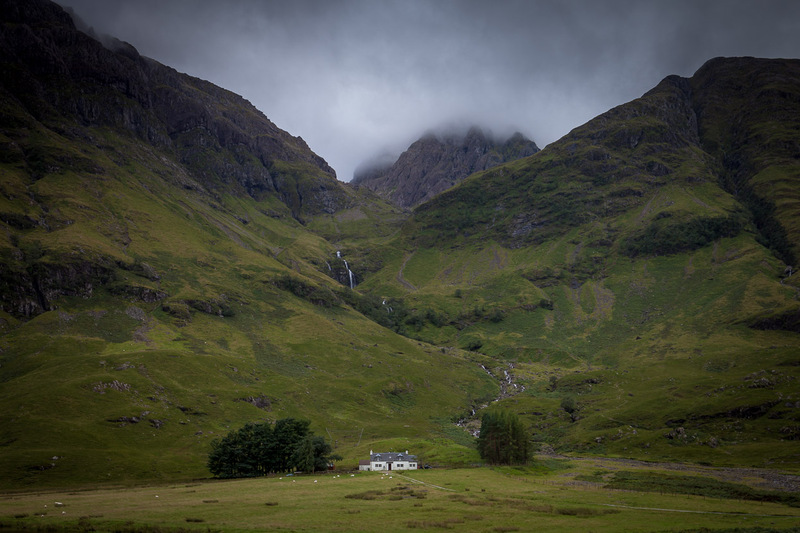 Scotland’s mountains are an attraction for photographer’s around the world, and for good reason. As a landscape photographer myself I was in heaven there. Wandering around the lochs and mountains is surreal. I managed to fit in quite a bit of photography around the other holiday activities, and it wasn’t enough to even scratch the surface. I shot several lochs and mountain views, along with visiting places such as the iconic Glencoe. I love the Scottish scenery so much, that I plan to retire there with my camera as soon as I am able! If you can visit Scotland as a photography enthusiast you really should! It is no wonder that the photographic tours that head to Scotland in droves are so popular. Being around the lochs and rivers of Scotland in the summer means that the midges are out in their masses. As soon as they detect the carbon dioxide from your breathe they hone in on it with the utmost precision and speed. Scotland is famous for its midges, and out on my photography trips I got mauled by them on several occasions. I strongly recommend that you take a mosquito net at the least. I haven’t tried any repellents though. 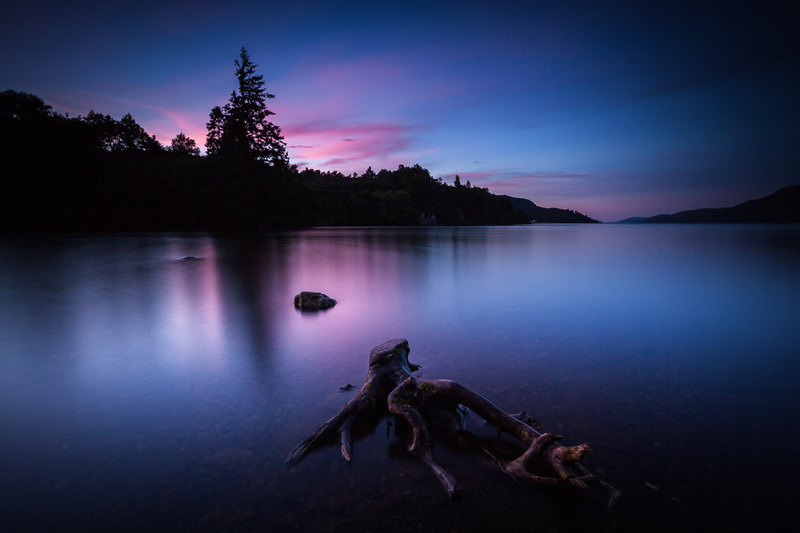 While dealing with the midges is a challenge, watching the sun set over Loch Ness such as when I took the photo above for example, is something you really won’t want to miss, and makes the midges seem like just a tiny price to pay to witness such beauty. Scotland is a stunning place. Although some parts are busy during the peak times, it is really easy to be on your own in the middle of nowhere in no time. I really recommend that you try it for yourself!